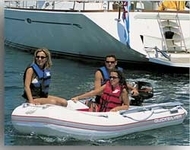 Quicksilver are the manufacturers of high quality inflatable and fibreglass boats. The Hypalon XD range features a premium quality, extra-heavy-duty fabric, which offers superior performance in most extreme conditions....including resistance to abrasions, hydrocarbons, fire, ultra-violet light, and fading. Its extreme resilience...plus its lightness, toughness and buoyancy, makes it an ideal material for inflatable boats. A great value boat if you're just starting out, or if you simply want a craft that is compact and a breeze to handle...yet it still has room for two bunks up-front, in a comfortably lined cabin. It even has a larger-than-usual front hatch, to make access to your anchor even easier...a common feature on all Quicksilver fibreglass boats. Recommended Mercury or Mariner outboard power is 75hp. The 'Dominator' is one of the most-successful cabin boats ever built in New Zealand and now available in Australia. It has been constantly refined, to ensure it remains one of the safest, driest, best performing family cuddies around. Today's Dominators perform beautifully with recommended Mercury or Marine 75hp outboards. A versatile family boat with a large practical cabin area on a proven hull, designed for a quiet, comfortable ride. Standard seating features include twin bucket seats, with the option of back-to-back seats. Thoughtful features such as an external self-draining anchor locker come as standard, ensuring that the inside of your cabin stays dry. Recommended Mercury or Mariner outboard power is 90hp. A deep-V, soft-riding boat that handles superbly on open or inland waters. It features a practical cabin area, and is an ideal day-boat for fishing, skiing, or just taking family and friends for a spin. The Senator offers excellent under-floor storage, plus several seating options are available, to tailor-make the space for the range of fishing and watersports activities you have in mind. Recommended Mercury or Marine outboard power is 115hp. The original 'Lightning' took the powerboat industry by storm as a race boat, achieving some remarkable performances in competition. today's breed of our 'Lightning' model is still an outstanding performer, with a great deal of emphasis on comfort too. The deep-V hull handles even the roughest water smoothly and quietly...and the roomy internal layout is great for fishing, cruising, and any watersport activities. An enormous underfloor locker, easily accommodates everything from wakeboards to picnic basket. Recommended Mercury or Mariner outboard power is 135hp. The Quicksilver pedigree is very evident in the 'Warrior', as this is a boat that's very much at home in both coastal waters and the open sea. It's an ideal boat for the fishing or diving enthusiast too, with carpets that lift out in moments, revealing a clear non-slip Gelcoat floor. Fit a Mercury or Mariner outboard...and you'll have a boat with quick throttle response, mid-range punch and outstanding top speeds. The 'Warrior' is also classy and comfortable...from the attractive woodgrain dash, to the lengthy V-berth cabin with full-sitting headroom. Recommended Mercury or Mariner outboard power is 150hp. The same 'Warrior' hull, but a different ride and feel with a MerCruiser sterndrive power-plant. The boat rides deeper in the water, with excellent balance due to the low centre of gravity. There's heaps of grunt for towing skiers and wakeboarders, and the boat gets onto the plane effortlessly...and stays there at remarkably low speeds. The engine cover can be put to good use too as extra seating, with a fold-down bench that boosts the boat's seating to accommodate the whole family and friends too.